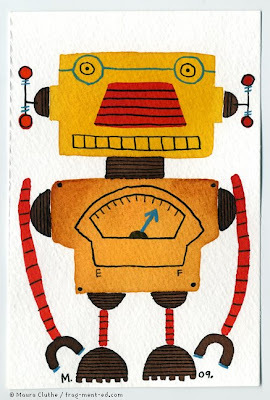 I never really know what's going to happen when I do these little robot paintings. I have a lot of fun creating them and when I sell one, it makes me happy to think that someone has found something within them that they enjoy enough to actually want to own one. It's a great feeling. Last week I received an email from Lanie Zipoy, a producer of a play called UNIVERSAL ROBOTS. The play opens next week, Thursday, February 12, in New York at the Manhattan Theatre Source. As it turns out, Lanie is a friend of a gentleman that bought several robot pieces from me last year. The Manhattan Theatre Source has a gallery that is attached to their theatre. Lanie emailed me to see if I would be interested in showing some of my robot pieces in their gallery for the duration of the play. Although I was pretty excited about the opportunity, I wasn't sure if I'd be able to send him anything. Then I realized not only do I have some pieces I could send, I might even be able to to create a few new ones. These two robots are a couple of the new ones that will appear in UNIVERSAL ROBOTS. I had fun creating these and am thrilled to be a small part of the show. The gallery show features two other artists as well; R. Nick Kuszyk and Lex Friedman. First performed in Prague in 1921, Karel Capek's R.U.R. (Rossum's Universal Robots) went on to become a seminal work of theater and literature that had a profound impact on science, technology and popular culture. A hugely influential science fiction story – before science fiction was even considered a genre – R.U.R. was inspirational to Isaac Asimov's pivotal writing on artificial intelligence and set the template for any number of robot-revolt stories to follow, from 2001 to The Terminator. The play tell the story of the titular island factory that makes the artificial workers called "Robots" that were originally devised by the reclusive scientist Rossum. A dark satire on the industrial revolution and humankind's blind faith in technology, R.U.R. builds to an apocalyptic climax before finding a redemptive – and startlingly human – conclusion. For more information on the play, be sure to check out the UNIVERSAL ROBOT website and/or blog. There's a lot of interesting stuff on there. 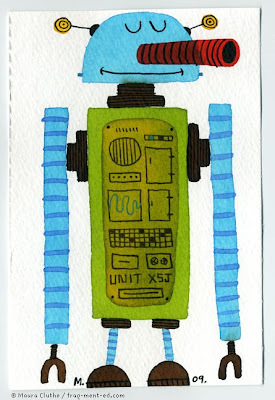 To see the 6 new robots (#40-#45) I did for the show, check out my flickr page. UNIVERSAL ROBOTS opens at the Manhattan Theatre Source February 12 and runs through March 6, 2009. Gallery hours are 12pm - 7pm daily. Directions to the gallery can be found here. Big thanks to John Issendorf and Lanie Zipoy for their support in my work. Wish I could attend the opening! Congrats on the show in NYC. I love the idea of a gallery show that pertains to the play. Good concept and there will be an appreciative audience in the gallery space. Always a plus. Especially like your Robot #42. It is exciting to think where this show will take you and your creations. Yeah ! And I can say, I knew you when !! Yay, congratulations on this! If by chance I am ever in that neighborhood, I will check it out!